The new Micro-Spline freehub body features smaller splines that allow for use of a 10-tooth cog on Shimano’s new 12-speed cassettes. To complement its new 12-speed XTR drivetrain that’s detailed in great length here, and brakes that you can read about here, Shimano has launched a host of new hubs (both XTR and non-series), plus new XTR-level pedals, a slick dropper post remote, and a new chain keeper. Here’s a rundown on each. New XTR M9100 series components will be available in fall 2018. The new dropper remote is claimed to have a lighter, more natural feel. 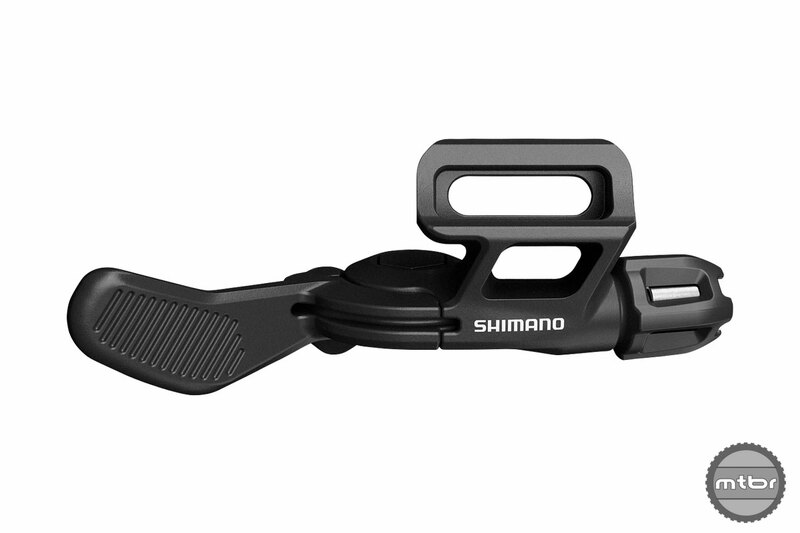 With the SL-MT800-IL Shimano introduces its first seatpost dropper remote, which features significant attention to ergonomics. The new remote, which is only compatible with XTR brakes, enables quick adjustment with a lighter and more natural feel, and is compatible with most dropper posts on the market since the cable clamps at the lever end. 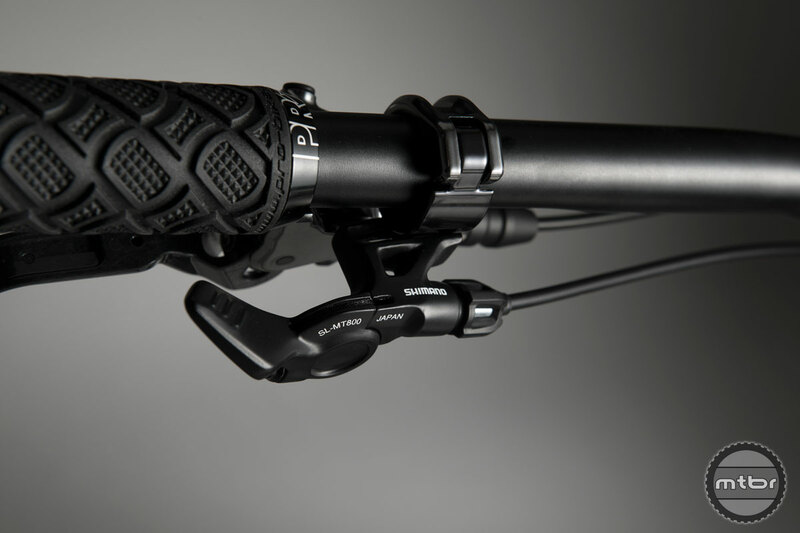 The dropper remote can be installed in the same position as a left shift lever using Shimano’s I-SPEC EV system design and offers 7mm of cable stroke. Price is $60. This guide allows for easy height adjustment as well as chain line adjustments. For racers and riders seeking single front chainring insurance, Shimano has rolled out its lightweight and adjustable SM-CD800 chain guide. This guide allows for easy height adjustment as well as chain line adjustments by loosening a single bolt and turning a thumb screw. Subsequent tightening of the bolt locks both adjustments at the same time. The chain guide is available in three mounting types: Direct, E, and ISCGO5. Price is $50. 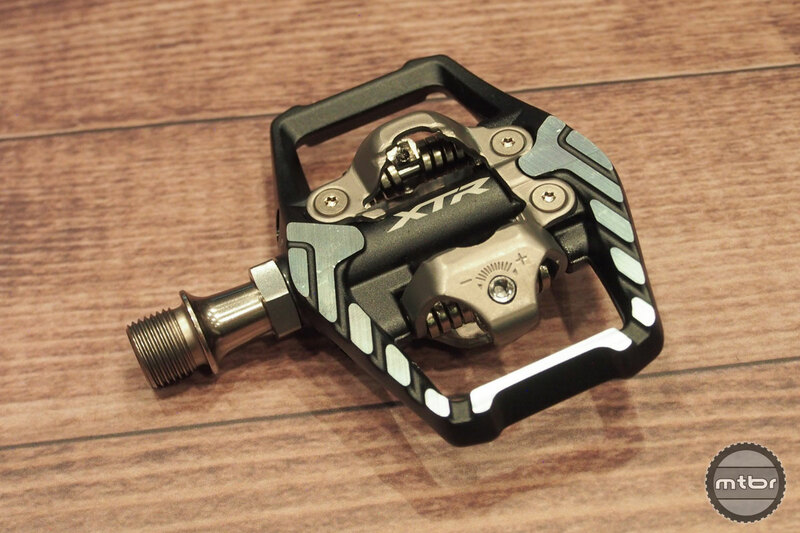 These new XC-oriented XTR pedals come in two axle length options, 52mm and 55mm. 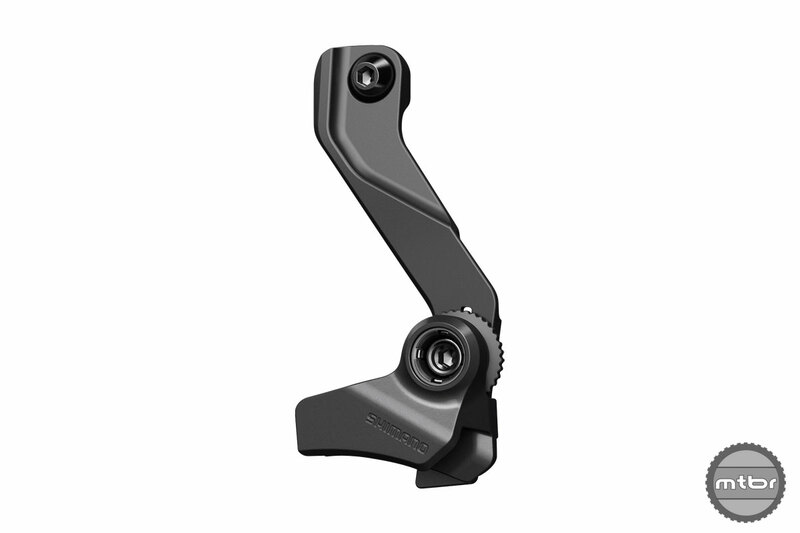 Shimano also has unveiled two new XTR-level pedal options, starting with the PD-M9100 ($180). These XC-oriented crank turners are claimed to improve rider stability with wider edge-to-edge contact area while improving mud shedding through more rounded contact points and off-set bindings. 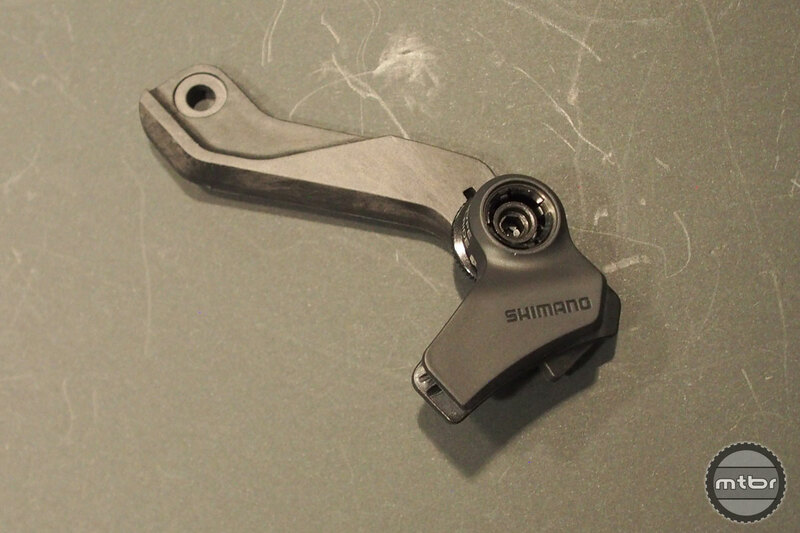 Shimano’s Rider-Tuned design offers two axle length options (52mm and 55mm). 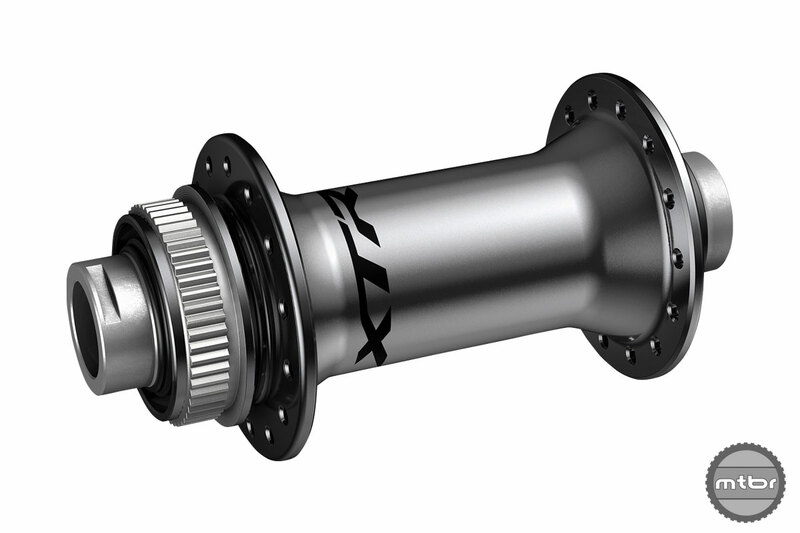 The shorter axle length minimizes Q-factor for XC riders who are running boost drivetrains. 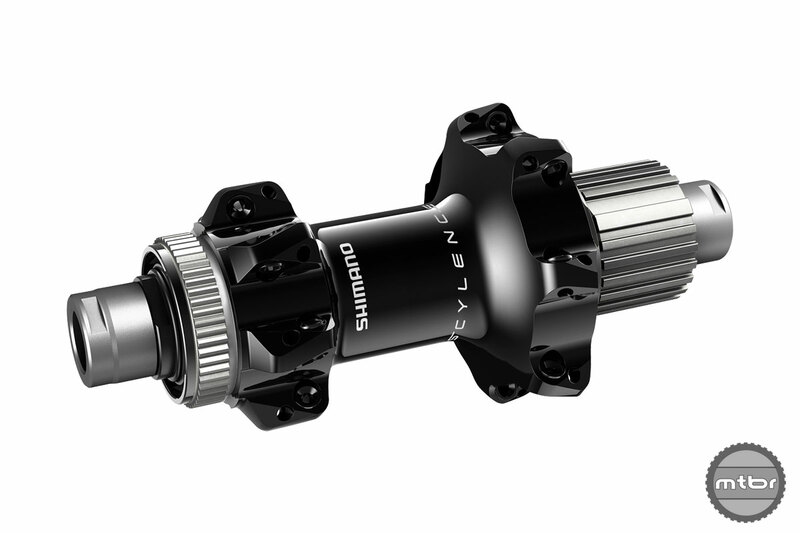 This new shorter axle also matches the Q-factor of Shimano’s SPD-SL road pedals, providing a smooth transition for road riders diving into gravel. Claimed weight is 310g (52mm) or 314g (55mm). 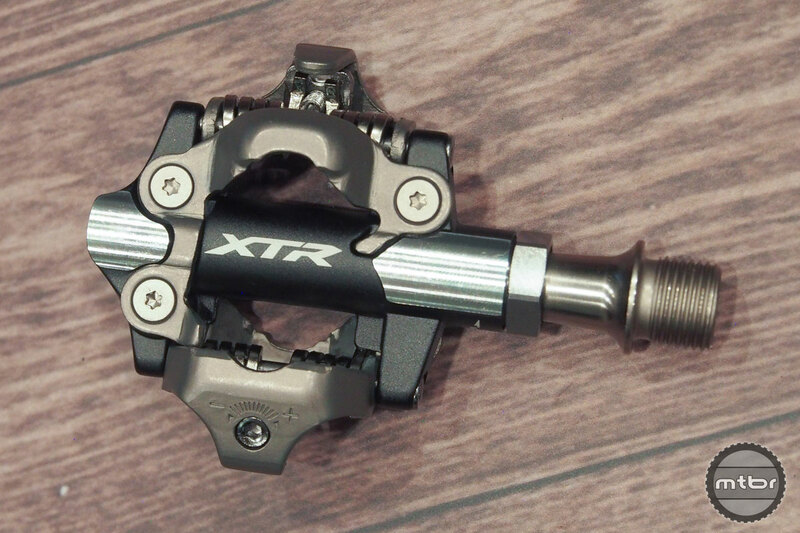 The new trail ready XTR pedals have a wider contact area. 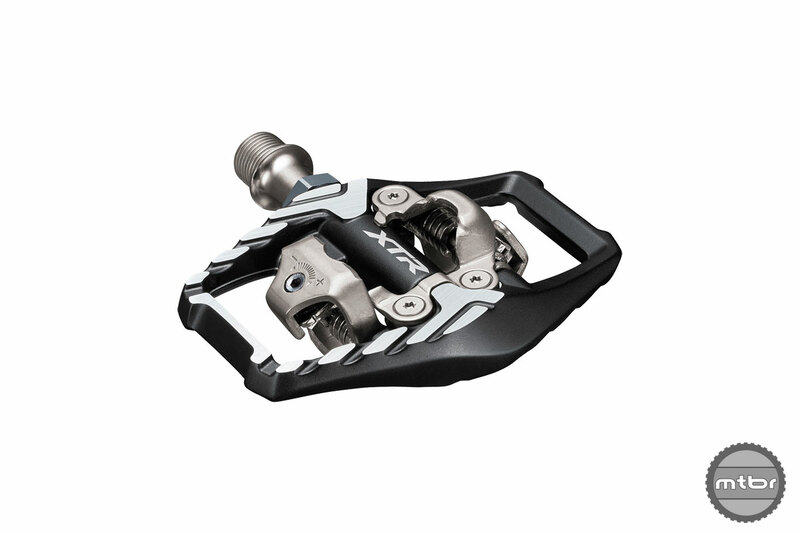 Also selling for $180 are the PD-M9120 XTR trail pedals, which feature a wider contact area, improving stability, while an expanded rearward shoe-pedal contact area better accommodates sneaker-style flat outsoles used in enduro and gravity riding. The Rider Tuned 1mm cleat spacer creates a better interface with shoes of varying outsole design and lug height. Claimed weight is 398g. 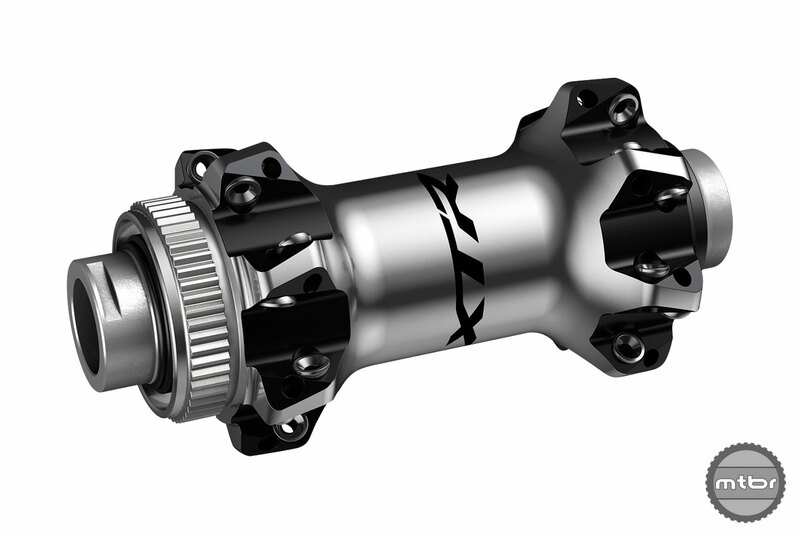 Finally, Shimano has rolled out new XTR and non-series MTB hubs, which of course all use the new Micro-Spline freehub technology. As the name suggests, Micro-Spline features smaller freehub splines that allows for use of a 10-tooth cog of Shimano’s new 12-speed cassettes. This helps eliminate damage/gouging to the lightweight aluminum freehub body. The Micro-Spline hubs also utilize what Shimano calls its Scylence system, which delivers 7.6 degrees of engagement for a very direct pedaling feel along with a silent coasting function. The new freehub body is constructed of two driver plates that completely disengage when you stop pedaling, thus eliminating any freehub ratchet sounds while coasting. Shimano will offer a variety of hub options, including XTR-level straight pull, as well as more affordable non-series hubs that also includes a straight pull option. Here’s a rundown. With FH-M9125-B, Shimano offers a wide flange rear hub option that provides improved durability through more balanced spoke tension and more rigidity with wider spoke bracing. The wide flange also reduces weight of the drivetrain as it was designed specifically for use with the new lightweight 11-speed XTR cassette. 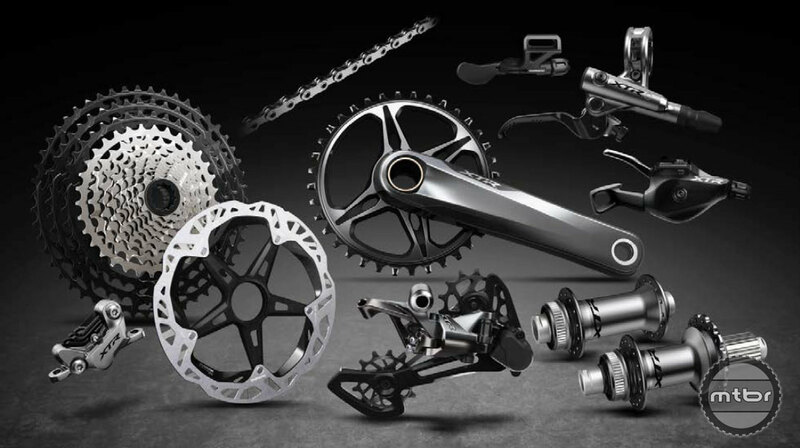 The entire new Shimano XTR group. While the press launch in Japan attended by Mtbr did not include any testing time, Shimano is coming to Mtbr’s Colorado headquarters in Crested Butte in mid-June, when the North American MTB press will get their first opportunity to experience the new XTR group. Stay tuned for our first ride review soon after. Until then, head to www.ridextr.com for more info on all these new components. 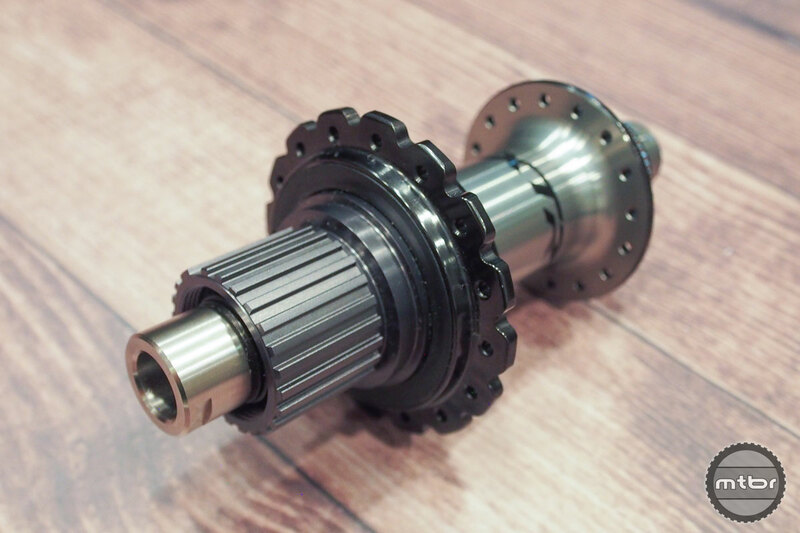 Micro-Spline features smaller freehub splines that allows for use of a 10-tooth cog of its new 12-speed cassettes, and says Shimano helps eliminate damage/gouging to the lightweight aluminum freehub. 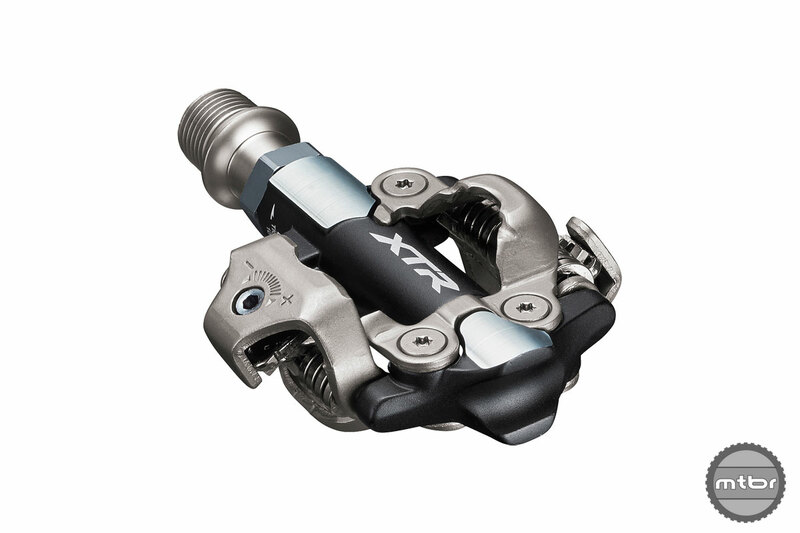 These new XC-oriented XTR pedals come in two axle length options (52mm and 55mm). The new dropper remote is claimed to have a lighter and more natural feel.